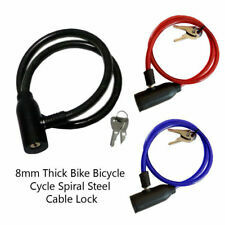 Combination Number Code Bike Bicycle Cycle Lock 10mm x 1000mm Steel Cable Chain. 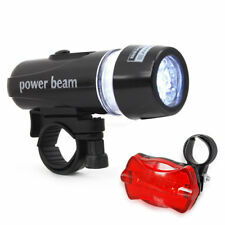 Waterproof Bright 5 LED Bike Bicycle Head & Rear Lights Light 6 Modes Wide Beam. 5 Bright White LED lights in the Front. 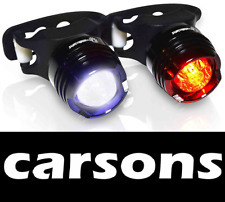 These Weatherproof Ultra Bright 5 LED Light set is perfect for low visibility or the Dark. 1 x Solar Powered Bike Tail LED. Solar powered. Solar power panel: 4 x 3 cm. 2 Bright Red LED. 4 Modes: Quick flash / Slow flash / On / Off. Easy to install. With adjustable clamp. WHATSAPP : 3275776760. NON ESITATE A CONTATTARCI. PER QUALSIASI PROBLEMA O INFORMAZIONE. Cycling Bicycle Bike Rear Tail Safety Warning 8 LED 2 Laser Flashing Lamp Light. With rechargeable battery, It can be recharged. Powered by rechargeable 1200mAh battery and this product can work a long time. Water-proof, improve the safety of ridding in rainy days (can't for diving use). light-weight and easy to use. Installed convenient and easy, it has 8 LED lights and 2 laser lights. Suitable for any bicycle, and this product can give alert in bad weather. Working time: Over 6 hours continuously. ADESIVO NERO. Puoi attaccarle sulla moto, sul casco, sulla macchina sulla bicicletta ! dove vuoi ! L'adesivo arriva pronto all'uso e una volta applicato non c'e' bisogno di altro. le colorazioni disponibili sono. Fuze Wheel Writer 2.0 LED Bicycle Accessory, 1 Count LED Bicycle Accessory that Mounts Directly to the Spokes, Pictures Magically Appear as You Pedal! LED Bicycle Accessory that Mounts Directly to the Spokes, Pictures Magically Appear as You Pedal! combined turn signal light, taillight, electric horn and brake light in one.aillights mounted on the side-post (less than equal 27.2mm) controller installed on the handle (less than equal 25.4mm), installed brake light control knob on the front or rear brake cable.the cable length between controller and taillight is about 127 cm;Power by 2 x AA batteries (not included).It really is a perfect choice for the cycling enthusiasts.This product combines turn signal light, taillight, electric horn and brake light in one SpecificationsMaterial: ABS Weight: 121g / 4.3 oz Package List: 1 x multifunction bike lampNote: Light shooting and different displays may cause the color of the item in the picture a little different from the real thing. The measurement allowed err. STICKER adesivi per BIANCHI 11 pezzi new. PedalPro Wall Mounted Bicycle Repair Stand. Also suitable as general bicycle storage. Secures your bike in a fixed position for easy cleaning, maintenance and repairs. 30kg/66lbs maximum load. Easy to install, standard wall fixings provided. Bicycle Wheel Rim Decals Stickers MTB Mavic CROSSMAX SL PRO Ltd 26" 27.5" 29"
Ideali per casco bici o moto! Realizziamo adesivi personalizzati e kit restauro moto, auto, biciclette! - Attendi che ti invii il totale aggiornato. THESE ARE NOT THE CHEAP STICKERS THAT ARE SIMPLY PRINTED ONTO CLEAR VINYL. THESE ARE PROFESSIONALLY CUT DECALS AS SUPPLIED ORIGINALLY ON BIKES. Overall sticker length is dependent upon the font style and the number of letters that you choose (see the table for comparison). Stylish design, durable material is very suitable for outdoor sports mountain biking bike riders hobbies. Simple installation, disassembly is also very simple. 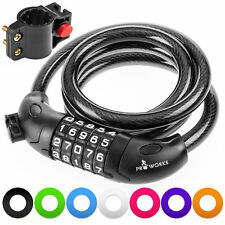 Designed for outdoor sports bike enthusiasts，Lock your belongings, travel safely. TRIXES Super Light Bicycle Bike Handlebar Rear View Mirror. 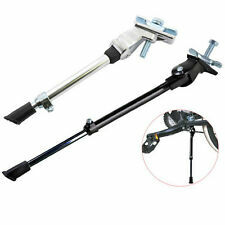 Great addition to any type of bike tricycle scooter or anything with handlebars. Improve your safety and vision with this rear view mirror that also adds style to your mode of transport. High Security Reinforced Motorcycle Bicycle Metal Chain padlock Ideal security solution to any motorbike bicycle, a must have piece! Covered with 600D Oxford fabric, durable and anti- corrosion It also provides protection for the wheels Comes with 3 matching keys, never mind of losing anymore Material: high quality stainless steel Main Color: Black Approx Size: 70cm/27.6"(L); 6cm x 3.5cm/2.4" x 1. For use with Schrader valves only (like a car tire valve). Easy to read analog gauge ensures accurate pressure. Product Overview & Key Features. PedalPro Folding Bike Basket. Fold out design hooks over front handlebars. Can also be secured to rear pannier rack. Quickly & easily folds up when not in use. Depth: 6cm. Screws knobs on both sides to unfold/fold/fix the two legs. Mounts on bike rear hub axle.Protect the painting of the bike with the connectors made of plastics.Can fold flat, taking up no room and is dead easy to use.Designed for outdoor or indoor use. Compact, portable and utility.Perfect for bike repair/parking/washing, drive train maintenance, variable-speed adjustment or just supporting the bike.Specifications:Color: BlackMaterial: Aluminum metal & engineered plasticsMax. height: Approx. 38cm / 15.0inProduct size: Approx. 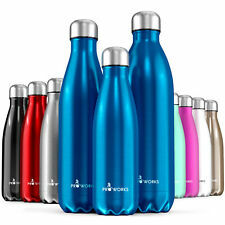 42 * 30cm / 16.5 * 11.8in(L * W)Product weight: Approx. 723g / 1.59LbPackage List: 1 * Foldable Bicycle Stand even though it is water-resistant.Packing List:1 * Solar-powered light1 * Installation kit1 * Sticker1 * Manual (English) . Motorcycle rev maker that fits on all bikes with standard 22.2mm handlebars. Throttle type grip. Makes a “realistic” motorcycle revving sound when you turn the grip. Length of grip: 90mm (approx). Note; Might be a bit tight for very young children under 5 or 6 to turn. New Genuine Cygolite Rack Mount for Cygolite Hotshot and Hotshot SL Rear Tail Lights. The hotshot Pro casts an extra wide beam to maximizes your presence from afar and a specially treated internal body disperses a radiant glow to keep nearby motorists alert. Adjustable brightness and flash tempo to get the right amount of light for the situation. Caratteristiche: grande specchio piano fornisce ampio e distorsioni. costruito in materiale infrangibile specchio e ad alta resistenza materiale ABS. colore: Nero. ADESIVI PRESPAZIATI REALIZZATI CON VINILE DI ALTA QUALITÀ GARANTITI 5 ANNI DAL PRODUTTORE. IL KIT COMPRENDE TUTTI GLI ADESIVI IN FOTO. COLORI DISPONIBILI: BIANCO, NERO, ORO, ARGENTO, ROSSO, VERDE, BLU, GIALLO, GRIGIO E ARANCIONE. Easily Removes From Bar In Seconds. Works For All Headlights Except For SL-200 & SL40WP. Works With: TSL-100, TSL-150, TSL-150 , TSL-200, TSL-250, TSL-250 , TSL-500, TSL-500 , TSL-1000, TSL-1500, SL-155, SL-255, USL-155, USL-305, USL-505, TSL-350, TSL-550, TSL-750, TSL-T1000, TSL-LT1000, TSL-1200, TSL-1800, TSL-2500, HL-1.1, & SL-30WP. The decals are available for Garmin Edge 500, 510, 520 (as shown), 800, 810, 820, 1000 and 1030 computers. Garmin Edge Model (500, 510, 520, 800, 810, 820, 1000 or 1030). The decals cover the top of the computer only, with a cutout for the screen section. Der elegante Mini-Felgendynamo von VELOGICAL ist extrem leichtläufig leichtgewichtig - eine langlebig wertstabile Standard-Komponente für LED-Lichtanlagen. Modern konzipiert für Ganzjahresradler und Sportradler. Brightest Tail Light Cygolite Makes! Hotshot PRO 200. The most powerful line of single LED tail lights just got even brighter. Zoom mode signals those around you with gentle changes in brightness. Freely adjust the brightness of Steady mode and the flash tempo of the flashing modes with the simple 2 button interface. Hope handlebar bayonet clamp that is compatible with all Hope R8, R4, R2 and R2i Light units. Set Of 2 Knog Lights GEKKO Rear Light And A FROG Front Light In Great Condition!